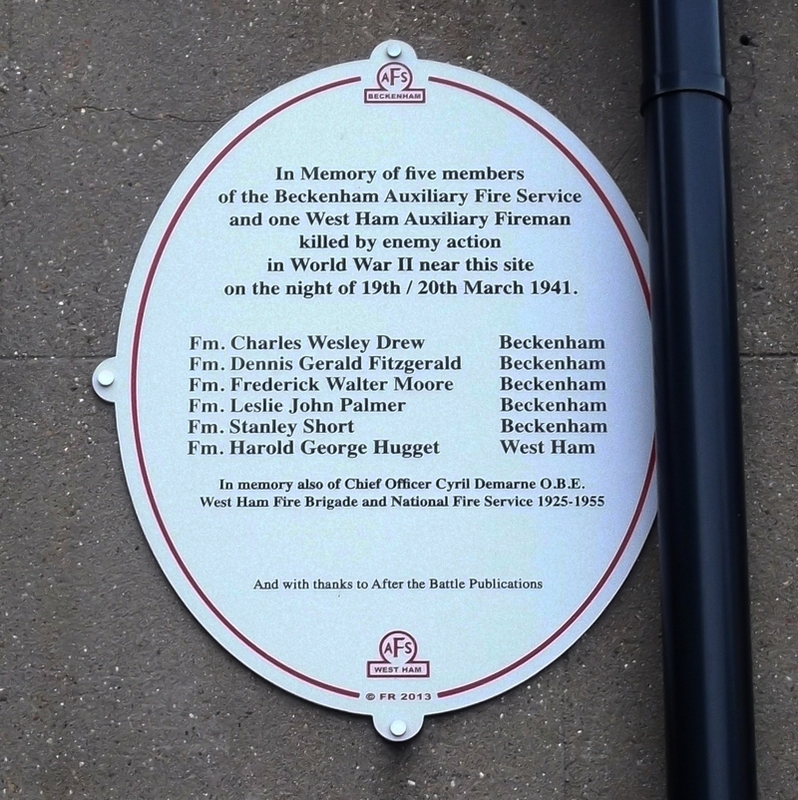 In memory of five members of the Beckenham Auxiliary Fire Service and one West Ham Auxiliary Fireman killed by enemy action in World War II near this site on the night of 19th/20th March 1941. In memory also of Chief Officer Cyril Demarne O.B.E. West Ham Fire brigade and National Fire Service 1925 - 1955. Our colleague Andrew Behan points out the following errors on this plaque: Fitzgerald's first name should have only one 'n'; Short was a Leading Fireman'; Huggett's surname should have two 't's. 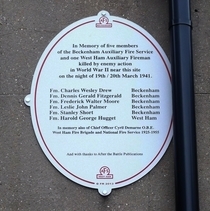 The Beckenham firemen are also commemorated on a plaque at Beckenham Fire Station, where the details are correct. We agree with Andrew that the errors are regrettable and the inclusion of Demarne and the publishers is questionable. We have found very little information about the event that caused the death of these 6 firemen in 1941. Normally someone, such as a local history group, has researched the event and published the details on the web. However, the obvious question (why were 5 firemen from Beckenham here on this night?) is answered at Newham Story forum: the five Coney Hall, Beckenham, men comprised the crew of a pump, one of a convoy on the way to a fire at Silvertown. Our colleague, Andrew, also discovered that a seventh fireman died at this event: Arthur James Goreham. He was from the West Ham station and was buried with his friend, Huggett, at the City of London Cemetery. Publishers of books and magazines about military history. George du Maurier lived here, 1874 to 1895.